Ashwagandha is a plant in Solanacea or nightshade family. It grows as a shrub, reaching a height of 170cm. As with the tomato, which also belongs to this family, Ashwagandha bears yellow flower and red fruit, though its fruit is berry-like in size and shape. It grows in India, Sri Lanka, and Pakistan. Ashwagandha is widely used in Ayurveda, an Indian system of holistic medicine. The root is primarily recognized for its adaptogenic properties. An adaptogen is a physiological agent with the ability to naturally increase the body's resistance to emotional and physical stresses. Ayurvedic practitioners traditionally use Ashwagandha to promote gentle relaxation and emotional balance. Occasional panic attacks or anxiety, mild to moderate mood changes, mental or physical fatigue, immune-system support, depression . All of the plant is used in herbal medicine. In Ayurveda, often the roots are boiled in milk, prior to drying them, in order to leach out undesirable elements. 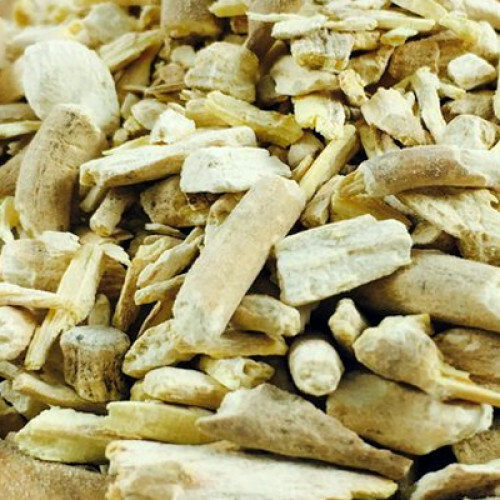 Ashwagandha is used as for sexual vitality, as an adaptogen, and as a sedative. As well, some herbalists refer to Ashwagandha as Indian ginseng, as it is used in ayurvedic medicine similar to how ginseng is used in traditional Chinese medicine. The product known as "Ashwagandha oil" is a combination of almond oil, Ashwagandha, and rose water, and is designed for use as a facial toner, and not consumption.